This project aims to provide software to create and use small size wikipedia dumps for embedded Linux devices. All Wikipedia pages will be stripped down html files compressed in a squashfs lzma image. 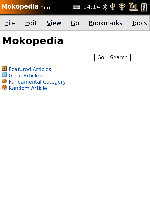 Join our irc channel on freenode: #mokopedia. It's the goal to make ALL the articles (except images) of Wikipedia (including formatting, linking, tables, formulas) fit on very little space. Tests show that the German Wikipedia will be around 1.3GB and the English Wikipedia around 4GB so with flash storage prices dropping I will not bother removing certain articles - the dumps will include everything. Some installation instructions can be found at http://rabenfrost.net/celtune/1-NEWS-WARNING-INFO (english) or http://seeseekey.net/blog/index.php?/archives/93-Mokopedia-einrichten.html (german). Some people are already running the new mokopedia on their freerunners but i wont announce any official info until enwiki isnt done so up to now there are only dewiki and others that are possible to use. I you are interested to get it running on you freerunner join our irc channel and i will explain the few steps you have to take. In the near feature there will be ipkgs for everything. There is no lighty needed anymore - i now implement the server in a simple python script. Now we have FULLTEXT search - yeah you hear right. a fulltext search through 6.8 GB of dewiki is possible in mere 20 seconds on the neo1973. Now there are also a lot of things already implemented as ipkg - only the server is left but will follow soon. This page was last modified on 19 July 2009, at 15:31. This page has been accessed 40,337 times.